I remember it being late summer. The kitchen cool ( it was always cool with a slight breeze coming through the south facing window) and dimly light as the forest of trees in the front lawn kept the house in a forever shade. The light or the lack thereof is what I always remember about that kitchen. There was more sweet corn ready for picking than could be consumed or given away. This was the intention in early spring when the seeds were sown. To have enough to fill the bellies of families and friends not just for the days and nights of summer but to feed us all through the long cold winter ahead. They knew that sweet corn was more than a side dish at supper, but that in mid-January it contained the power to lift the thick blanket of winter bleakness with a single bite. They nourished our bodies and our souls. The oval wooden table in the middle of the dimly lit kitchen, covered with ears of corn. 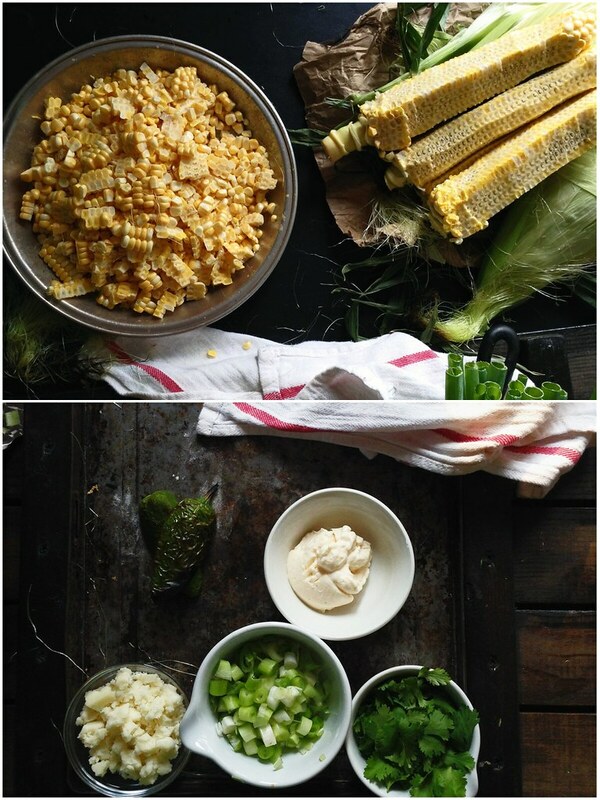 All in various stages of shucking and cooking and corn kernel removal-ing and storing. Steam billowing from heavy bottomed stock pots fiercely boiling away on the electric stove. The cabinets above glistening with the condensed dampness. Her face wore a similar sheen. These were the stations, all supervised by her and manned partially by us. It was a process. A job. A duty. And corn wasn’t the only vegetable stored and stocked away for the coming winter. By this time she had already canned green beans, tomatoes, and various jellies and jams to last until they were fresh again the following year. When you say sweet corn. This is the memory. This is the image that pops into my brain. This is what lies behind my eyes. I have many more ears of corn than one person can/should eat. I have similar plans for this abundance of corn as they did. I will shuck it, boil it, sheer off the kernels, and store them in plastic freezer bags. They will remain frozen until we are knee deep in winter and needing a bit of a boost. Summer revisited. A flood of memories to float upon. 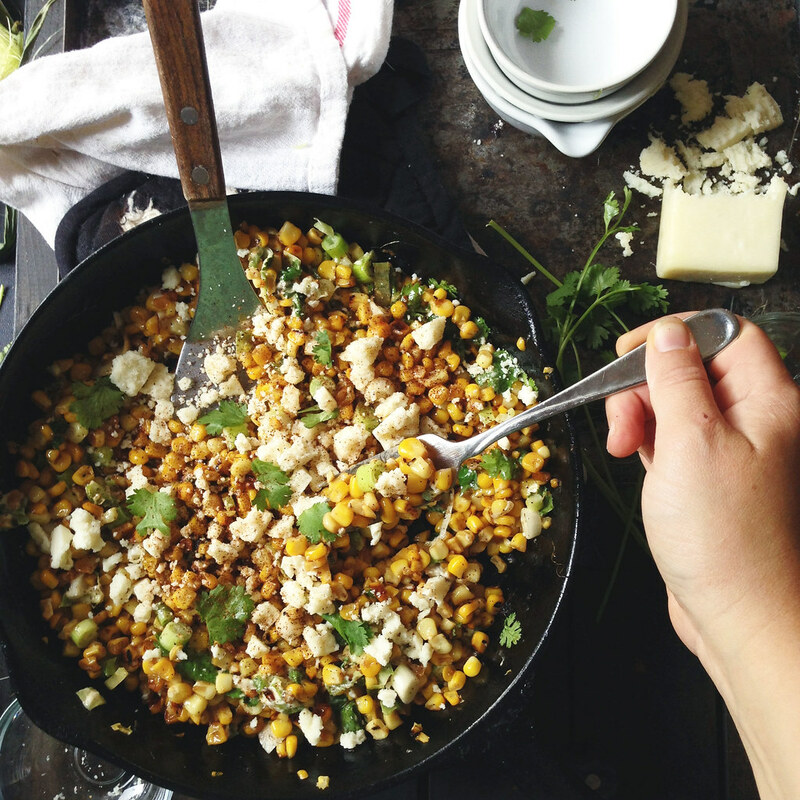 Mexican street corn isn’t something she would have ever made. 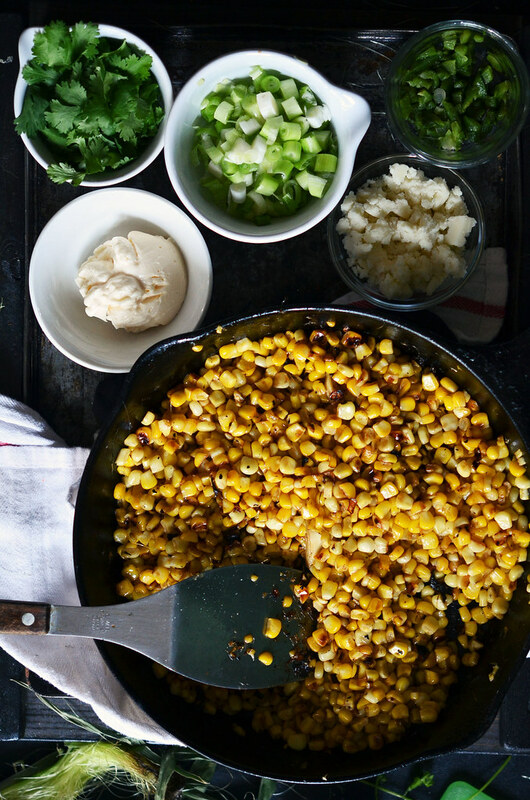 Beyond salt and sweet cream butter, nothing was ever added to corn. It doesn’t need it, really. 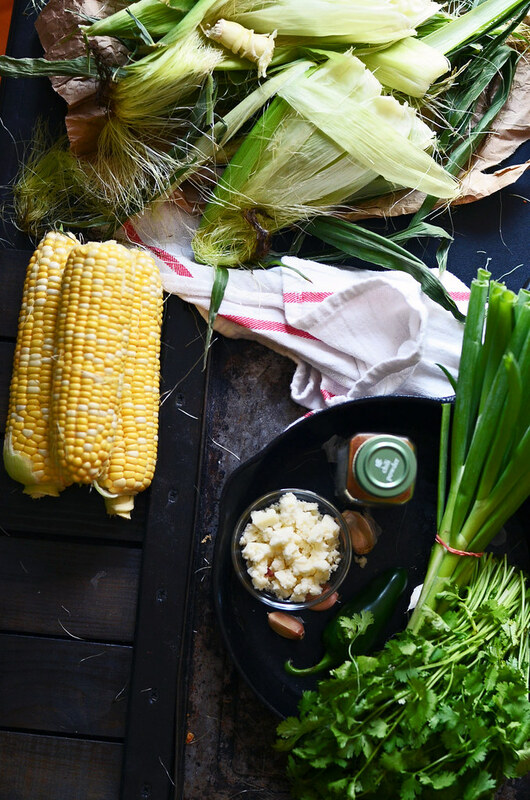 However, I sometimes can not leave well enough alone and find it necessary to layer a few more flavors atop the already swoon worthy Ohio sweet corn. 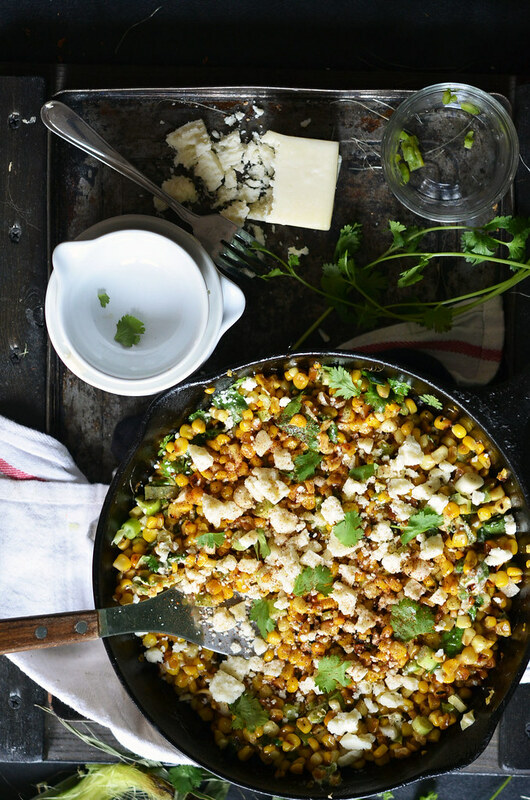 Skillet Mexican Street Corn is good. Very good to be honest and if you are corned out for the season (is that possible?!?) 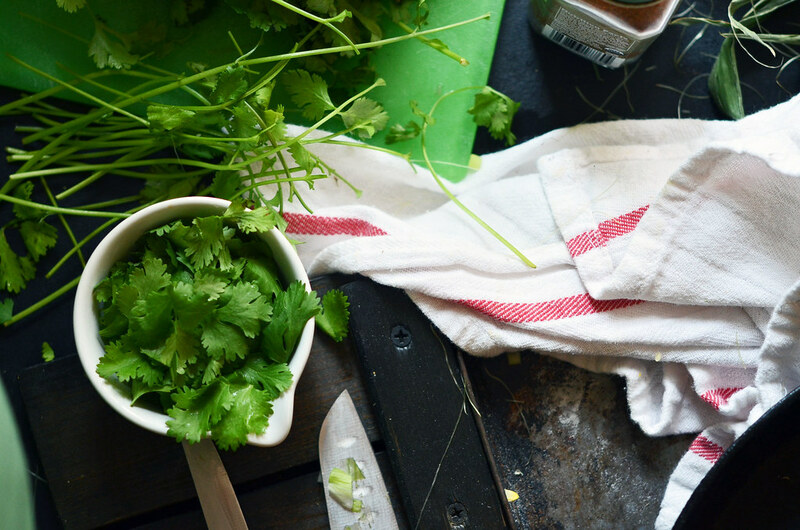 it perhaps will lend a bit of pizzazz to your supper table. 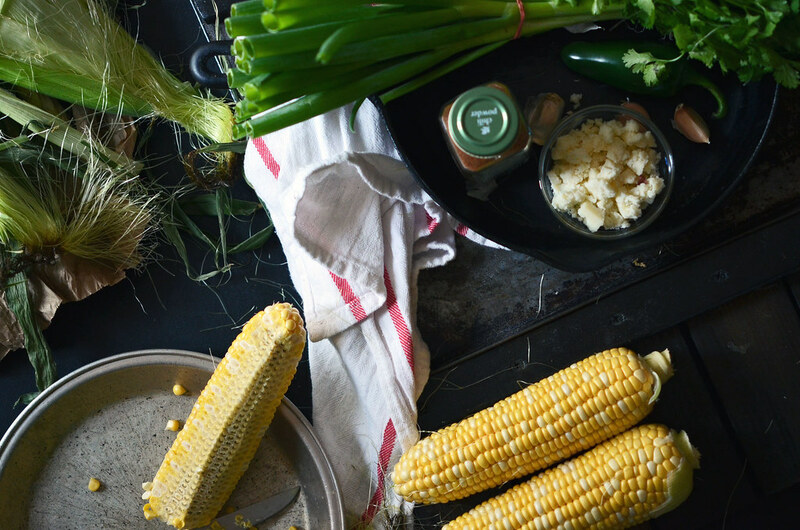 Skillet or on the cob, ingredients tossed and layered or slathered and sprinkled…eaten with a spork or in the fashion of a typewriter…it’s summer, choose your own adventure, and call it a day. To roast jalapeño, turn boiler on high and place oven rack on top shelf. Place a piece of tinfoil on rack. Slice jalapeño in half lengthwise and remove seeds. Place jalapeño cut side down onto tinfoil. Broil until jalapeño skin starts to blacken (about 5 minutes or so - keep a close eye on them). Remove from oven and let cool. Once cool, remove skins and finely dice. Set aside. Heat a large skillet over medium high heat, add vegetable oil to coat bottom. When it is hot - it'll have slight ripples on the surface. Add corn and whole garlic clove and a pinch of salt. Cook corn until browning on one side and then toss. Continue to cook until corn is browned well and charred in spots- about 5 to 7 minutes. If corn begins to pop or darken too much, reduce heat. 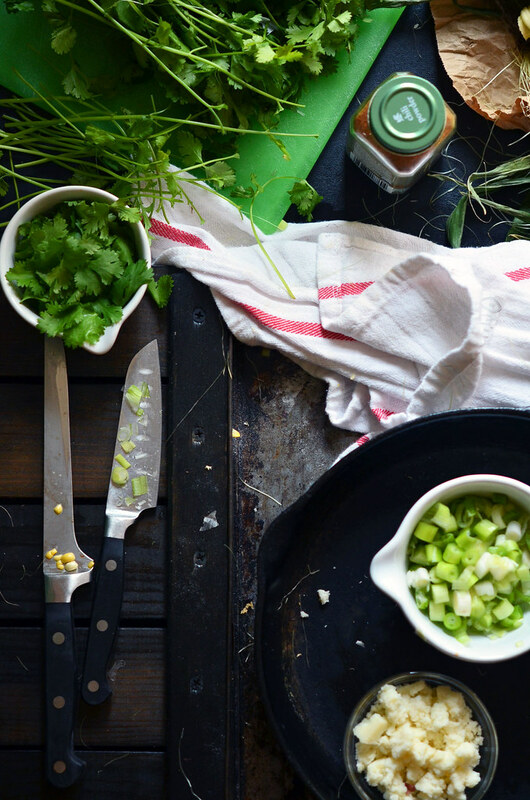 Once cooked, remove from heat and remove garlic clove. Stir in mayonnaise, green onions, jalapeño, and lime juice. Taste and season with salt to your liking. 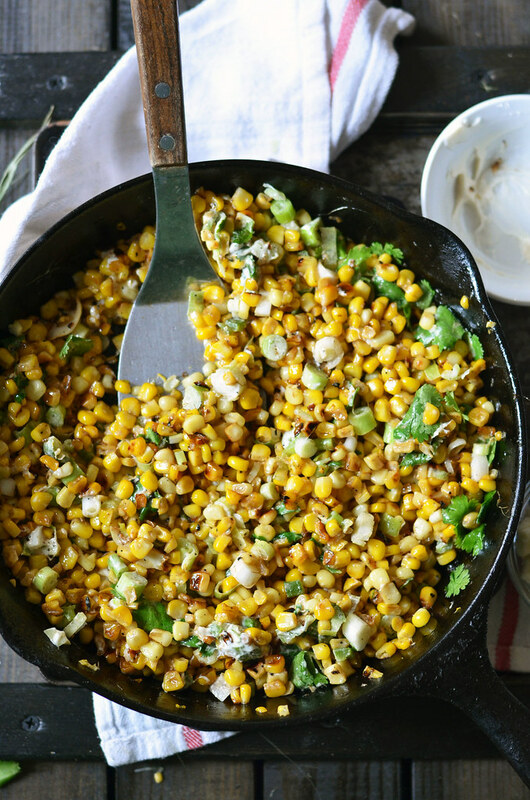 Evenly sprinkle chopped cilantro leaves, crumbled cotija cheese, and chili powder over corn. Serve warm. Store in sealed container in fridge. Reheats well the next day or eaten cold! 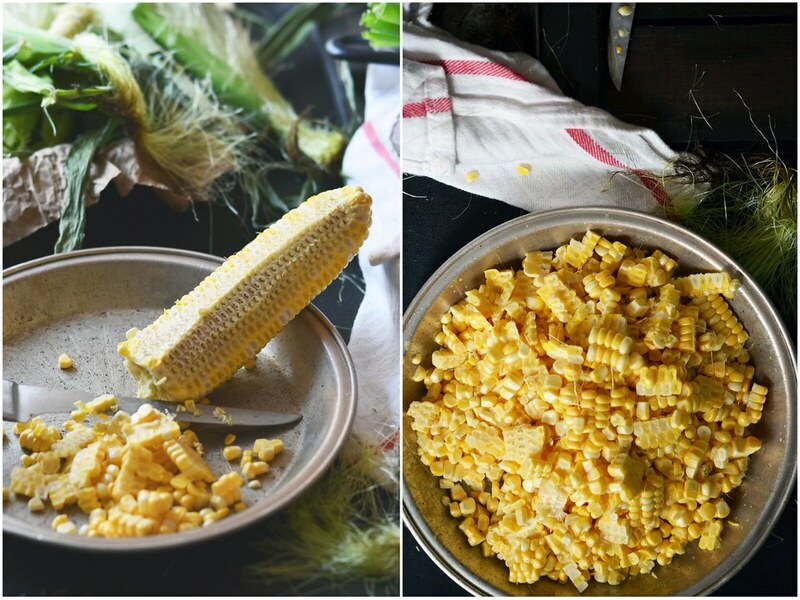 Rather than making this in a skillet – this can be eaten on the cob. 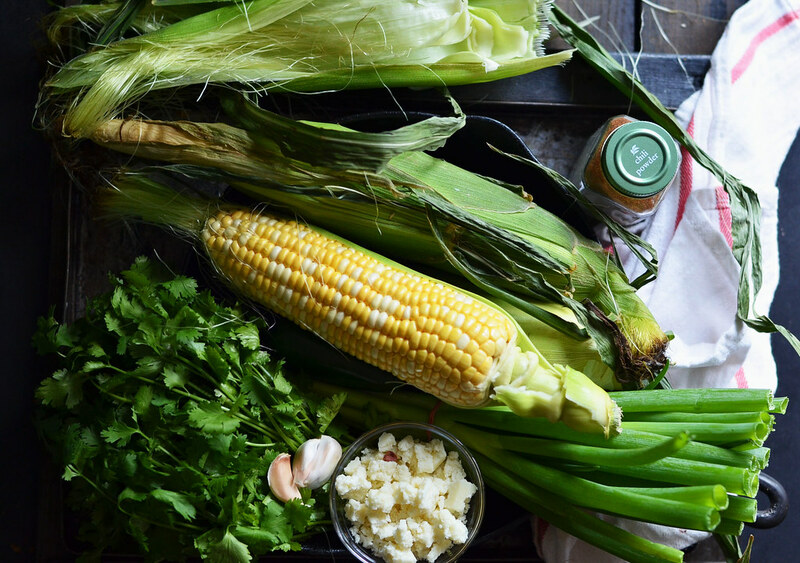 Boil or roast or grill ear of corn, slather with a bit of mayonnaise, sprinkle with green onions, jalapeño, cilantro, cotija cheese, and chili powder. Squeeze fresh lime juice over and a touch of salt. Eat.